Cut peppers to halves, scoop outthe seeds in a bowl, mix tempura flour with water to a smooth blend in a separate bowl, combine filling ingredients. Stuff peppers with filling. Get oil to boil dip filled peppers in tempura mix. Make sure all sides are fullycovered. Deep fry till color of tempura mix changes to golden brown take out and put on papertowel to absorb oil. 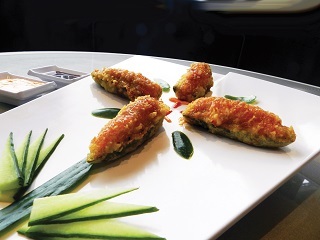 Top with Sushi Tokyo's sweet sauce &decorate with vegetables to your taste.